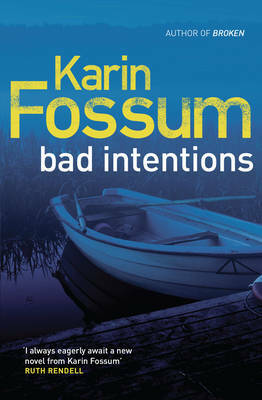 BAD INTENTIONS is the seventh of Karin Fossum's Inspector Sejer novels to be translated from Norwegian. At the beginning of BAD INTENTIONS we are introduced to three young men, long-time friends, who are staying in a cabin at Dead Water Lake. There is an uneasy relationship between them and one of the three has been released from a psychiatric hospital for the weekend. A late night boat trip on the lake ends in tragedy and only two of the group return to land. Not wishing to draw attention to themselves they delay reporting the incident until the next day and when they do, Inspector Sejer and his sidekick Skarre enter the picture. Sejer immediately senses something fishy about the set-up and interviews friends and family of the three and though he gains some useful information, his investigation runs out of steam and the "case" is closed. That is until another incident involving water brings the friends to the police's attention again. BAD INTENTIONS, like most of the Sejer books is not a police procedural. The detectives don't appear that much and nothing much changes in their personal lives from book to book - though Sejer now has a new dog, Frank Robert, and is feeling his age a little. There's still no mention of his potential girlfriend, the doctor, who appeared a few books ago (though she may have disappeared in the as yet untranslated book seven of the series). Fossum has said she has no particular interest in her detective and increasingly more of the narrative is given over to the victims, witnesses or other participants. One of Fossum's skills is her creation of totally believable characters and her empathy with those whose lives are spiralling out of control through a moment's thoughtlessness; a theme she has explored in WHEN THE DEVIL HOLDS THE CANDLE and BLACK SECONDS. In BAD INTENTIONS, the main characters aren't bad people and the consequences of something they've been party to are dealt with differently by the three friends with different outcomes. Fossum has a fine body of work, my favourites being DON'T LOOK BACK and CALLING OUT FOR YOU. Perhaps a quieter book than some of her earlier work, BAD INTENTIONS is still a typical example of her thought-provoking, uncomfortable and melancholic reads, here sympathetically translated by Charlotte Barslund.